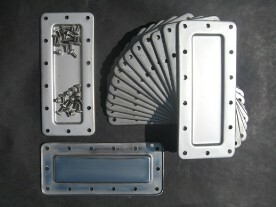 This product is exclusive to Vintage MG Parts and we offer a lifetime guarantee on this part. Since our introduction, a cheap copy has appeared on the MMM market which we note is of a thinner gauge of c. 1.00 mm thickness and so ripples during the pressing process. We developed our tooling and product beyond this stage to provide a quality product which is thicker, ripple free and comes with a lifetime guarantee. In addition to the above, we can supply stainless steel hex head set bolts to complement the water jackets. This material has been chosen to avoid the documented corrosion problem whereby mild steel coated bolts have been notorious for shearing off flush with the block, resulting in rather inconvenient redrilling and tapping. We also stock nitrile rubber gaskets for the C, M, D and J Types as well as the OHC Morris Minor to complement this set. The outer rubber profile has been drawn up to perfectly match the machined block face to eliminate any untidy overspill of the gasket itself and the scew holes are all cut undersize to assist sealing. Nitrile rubber gaskets are resistant to the petrol ethanol additive problem which is becoming a progressive issue in the continued running of vintage cars. In addition, nitrile does not deteriorate with age.